Less than 48 hours until we leave……. Thank you, Connie, for mailing me “Indian clothes” to wear while traveling…..
Our house is finally beginning to show signs of an approaching trip. A mixture of suitcases and supplies for Nick’s Foundation ministries -Basket of Hope, Nick Nooks, and Adrienne’s Angel Memory Boxes- cover our living room floor and furniture. God has definitely opened the door for so many opportunities to reach out to others who are hurting. We are thankful even though we would trade all of this for Nick’s presence with us. We fly out of Cincinnati at 4 p.m. on Thursday and then out of New York at 11 p.m. We land in New Delhi, India around 7:00ish pm (India time) on Friday evening. We lose a day as we are flying, which truthfully boggles my mind. I told my mom that if you can lose a day and stay on this planet, then there is no telling how time really works in Heaven. The Bible says that to God, “a day is like a thousand years.” I truly believe that! Someone told me recently that if that is literally true, then a lifetime on earth is just a few hours in God’s time, so Nick and Adrienne may only be “waiting” for us for a couple of hours at the most!!! I love that thought!!!!!!!!! Well, I just wanted to send a little note and let you know that I am not sure how often I will be near a computer after tomorrow and how much time I will have to blog until Easter Sunday, but I will write in my journal the entire trip and pray for you all constantly. When I get home, I will share all of my memories with you. I am praying that God will use this trip to touch all of our children’s lives in very significant ways and that we will feel Nick and Adrienne’s presence with us constantly. I am praying that this trip can form a bond of ministry between Nick’s Foundation and the orphanage that will help the children there in very special ways. Who knows? Some of you who are reading this may very well be traveling to India some day to do a week or so of mission work! I’ll be praying about that too! I really can’t imagine what we are going to see and experience. I am nervous, excited, sad, happy, anxious, calm, and every other emotion rolled into one……. This is God’s trip. I’m going to have to totally lean on Him for my every need. I’ll write one more time (at least) before we head out Thursday. I will write again tonight, but I just wanted to send a quick note to tell you that in the midst of our packing and planning, you are all on my heart and mind. 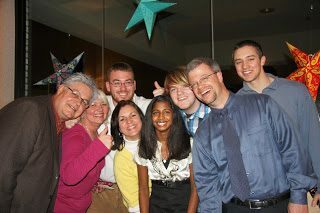 I just recently received all of the pictures from Nick’s first annual Night to Remember (thank you, Lesa!!). Behind all of these smiles there is a depth of sadness that words can never express. My prayer for all of you today is that you will feel love, joy, peace, and hope as you walk with Him! A list of names I knew I had. For all to win….I wanted….bad! Wrote with care, and cut the same. Said a prayer as I filled my bowl. Asking for joy to fill each soul. She drew with care until she was done. So until we draw again, don’t be blue. You never know-next time-it might be YOU!!! This sign caught my eye at Grayson Lake a couple of weeks ago. I guess if we pick up enough of these rocks and try one of these feats, eventually the hill underneath these rocks begins to erode and the beach begins to wash away. 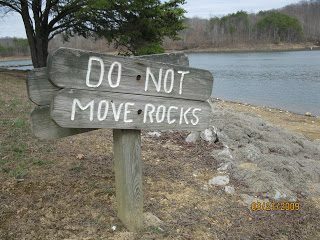 The camp rangers at Grayson Lake must have decided that they had to put up a sign in order to remind people that moving these particular rocks was not a good idea! Wow!!! Those rocks are there to this day!!! Now those are some unmoved rocks! 17Jesus replied, “Blessed are you, Simon son of Jonah, for this was not revealed to you by man, but by my Father in heaven. Jesus Christ is the Son of the Living God!! Now there’s a Rock that hasn’t changed or moved!!! I think of all the things in my life that seem to so easily slip away…….right from underneath my feet. And then I think of Jesus!!! And I think of the promises in His Word! Over and over again, God’s Word reminds us that Jesus is the Rock on which we must stand and that this Rock cannot be moved. Oh, thank you, Father, for being my Rock. Even when I feel as if everything that matters in my life is being washed away around me, help me find comfort in knowing that my feet are firmly planted on You!!! My Rock, My Fortress, My Salvation. You are the one Rock I pray I will never try to move! 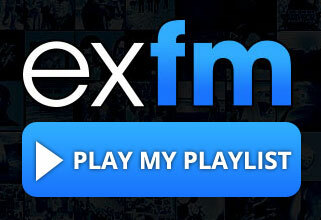 You have another day or so to enter the give away by posting on the “giveaway” blog below. The package hasn’t arrived from the publisher, so I’m not sure how many copies they are sending me yet. I’ll post winners just as soon as we find out how many to pick! I was sitting in an 8th grade gifted class yesterday observing students as they “interviewed” each other to try and discover the “mystery history person” they were impersonating. As the kids were talking, laughing, and learning, I looked at the board and this photograph struck me as so powerfully. I walked up to the board to read the description below the photo and felt as if for some reason higher than mine, I was suppose to photograph this photograph. It just spoke to me. 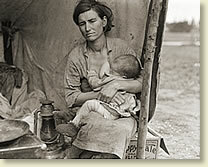 This morning I did a little “google search” of the photographer’s and read the most amazing story of how Dorothea Lange had been on a month-long assignment for the Farm Security Administration when she was traveling back home and happened upon a tiny, fabric tarp propped on sticks in the middle of a field with this mother and her seven children (there is a baby in her arms) huddled inside. They were living off of frozen vegetables on the land and birds that her children could kill. They were pea pickers and all of the peas had frozen, so they were jobless. The precious lady pictured above with some of her children was only 32 at the time this photograph was taken. “Dorothea, how about that camp back there? What is the situation back there? Nobody could ask this of you, now could they? To turn back certainly is not necessary. Haven’t you plenty of negatives already on this subject? Isn’t this just one more if the same? Besides, if you take a camera out in this rain, you’re just asking for trouble. Now be reasonable, etc. etc., etc. Having well convinced myself for 20 miles that I could continue on, I did the opposite. Almost without realizing what I was doing I made a U-turn on the empty highway. I went back those 20 miles and turned off the highway at that sign, PEA-PICKERS CAMP. She went on to share that the woman allowed her to take pictures of their situation as if she knew that these pictures may in some way help her family. I wonder what happened to this lady after the picture day in 1936. I am struck at the thought that yesterday was Olivia’s picture day at school and I was able to help her curl her hair so that she felt “pretty” and excited about being photographed. And I also think, “Do I ever have the right to be negative or complain?” No wonder God does not like grumbling or complaining….He sees the sufferings of all. He knows how blessed we are even when EVERYTHING around us may seem dreadful at times….He knows how much more dreadful it could become. Oh, thank you for this middle school teacher who is sharing the hardships of the past. I hope the students are as moved by this picture as I was. Thank you for this woman who years ago allowed herself to be humble enough to be photographed at her lowest point in order to help her family. I have a feeling that she has helped more than just her family in the past 70+ years since that photo was taken. I know that yesterday she helped me. Forgive me, Father, when I complain. Keep this photo forever in my heart. First Blog Give Away!! And "Hi" Ian….From Phillip!! 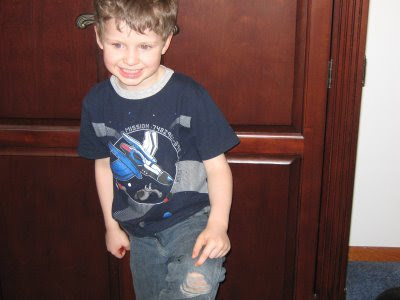 Phillip got in on the “holey” jean action and sent these pictures tonight to his buddy Ian!!! 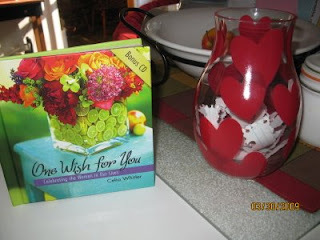 I also wanted to let everyone know that the publishers of “One Wish For You” have asked if I would like to give away a few copies of this new book!! So, if you post a comment with your email address you will be in a random drawing that I will have this weekend!!! I am not sure how many copies they are sending, but I will announce the winners on Sunday and then email you to get your mailing addresses!! Hi, Phillip!! From Your Buddy Ian!!! 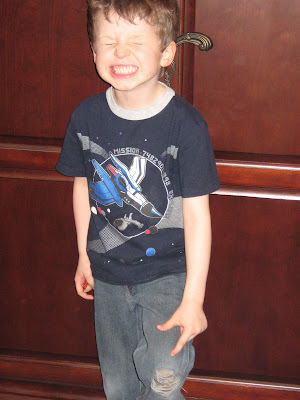 When he comes to visit, he loves to play with Olivia’s friend’s little brother, Ian. They are “best friends” according to Phillip!! 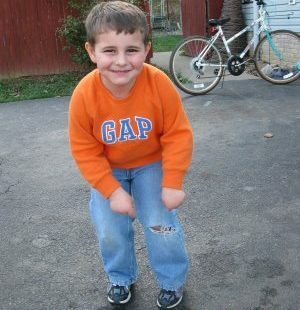 The other day Jennifer emailed to tell me that Phillip is going through this stage where he’ll only wear jeans if they a hole in one knee!!! 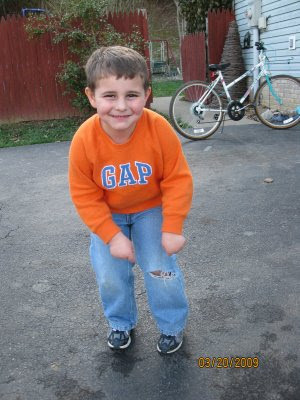 I just about lost it when Ian walked up to our house to get Cameron the other day and had on a pair of jeans with…. a hole in one knee!!!!!! I had to take a picture of Ian!! Now I’m hoping to get one of Phillip in the same pose! Isn’t that the great thing about friendship……you don’t even have to “know” what each other is doing to share a special bond! I had to run to Cameron’s house tonight to pay for Girl Scout cookies and Brooke (Cameron and Ian’s mom) was on my blog. Ian was looking at the pictures of Nick and saying, “I miss Nick…” Cameron came out of her bedroom and was wearing her “Remember to Celebrate My Life – Nick t-shirt.” The whole experience just touched me so deeply!!! When I got home from paying for cookies and stopping at the store with Olivia for “school lunch supplies,” Nick’s buddy Brandon was at the house(at 9 p.m.) to show me a “thumbs up” picture his girlfriend had found under her mouse pad in the computer lab at school today!! WOW!!! Brandon, I enjoyed our visit so much! You are one of my boys, you know?! You still amaze me. You are with me every second of every day…and truly I think you are with so many more than just me!!! I’ve only had one meltdown today…an unexpected one…. Driving by the outreach center, I just had a flashback to all of the times we went in the back door for blood work and then waited to see if Nick needed another transfusion…. He was such a trooper…and the nurses were amazing…. 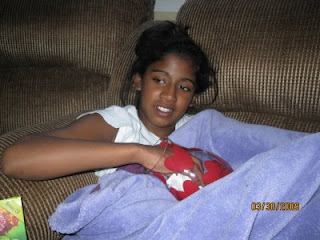 Thank you, Roxy, for being on the other end of the phone when I called the middle school about a meeting I had……..you let me cry…….and that meant the world to me…..thank you, Nicki, for coming out to the car for our “meeting.” You saved me from facing the masses….that meant the world to me, too! Thank you Grayson Church of God and Karen for having me out tonight to talk about…. Peace…when the river runs wild! Your prayer circle around me will never be forgotten! I feel blessed. I “heart” Ian!!! I love you, sweet little b oy!!! I love you, too, Phillip!! a mild sense of road rage……. 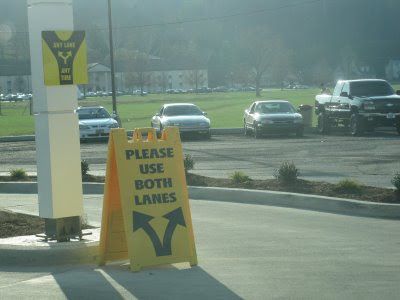 The concept behind the drive-thru is that everyone gets in one line and then as you reach this portion of the drive-thru you branch off into whichever lane is open next. But sometimes a customer will come barreling past all waiting customers and “cut” into the right lane…..nothing against you if you’ve done this…..I’ve probably even done this….. But I’ve been in line when I’ve had friends further behind me in the line who have actually called me and said, “Can you believe some people!?!? !” It’s hilarious! I might start out in the line just wanting a diet coke and the next I know I’m judging people’s motives and feeling injustice of some kind…..
Every day we have choices to make. However, there are some decisions that scream……ONE WAY ONLY! We know deep inside that making the other choice is AGAINST GOD! So, this morning I was faced with a dilemma…..
Then I called my friend whom I was going to caravan with and she had already left. This meant that I could come out a little later giving me a more flexible schedule. Now the choice sits before me again. I feel like God gave me a second chance to spend some time with Him. First of all, as hard as it is sometimes, try to worry about your own decisions…not other people’s (I’m talking to myself on this one too!). Secondly, know that sometimes both choices might be acceptable in God’s eyes, so just pray for peace as you decide on one them. So when it arrived in the mail, I was very anxious to see what it had to say! First of all, I was so excited because not only was it a great little book but it also had a bonus CD which has some very powerful songs on it! Wow! Celia, you have a beautiful voice!! As I began to read through the pages…. 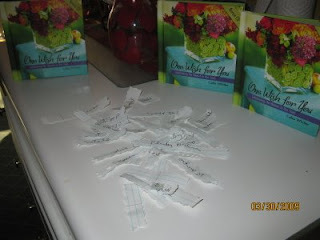 I was touched by the presence of Scripture as I turned every page and soaked in every wish.The photography accompanying each Scripture wish was perfect too! 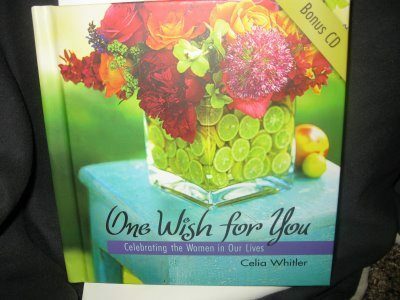 I truly felt as if someone had written the book just for me…..
full of heartfelt wishes based on Scripture! This little book is easy to pick up and simply savor one page at a time. Short, sweet wishes, wrapped in Scriptures. That’s what you find on each page. I imagined slipping this into my purse to take to a doctor’s appointment. Or mailing a copy to a friend who is having a difficult time. Or tucking in my daughter’s backpack so she’ll remember how much I love her and that more than anything my wishes for her are all rooted in His Word! Or handing a copy to any of my children’s teachers (Sunday school or school) or coaches……just to let them know I’m cheering them on with Heavenly wishes. If you’re looking for a little something to place in an Easter basket or to brighten a girlfriend’s day or to give your mom on Mother’s Day, this would be a great option! Thanks, Julie, for allowing me the chance to preview this book of treasures! As I read Celia’s bio, I couldn’t help but wonder if she knows my friend Lara…..they are both from Franklin, TN!!! Wouldn’t that just be something?! I could see God doing that! showered with moments of love because the Creator of the Universe loves you! wrapped in peace because the Prince of Peace promises nothing less to those who trust in Him! filled with hope because you KNOW who holds tomorrow! sprinkled with joy……..in all things at all times……..because the Joy-Giver walks beside You….transforming your heart as you turn all things over to Him!